Cat Chat With Caren And Cody: Kitty’scape™ Cat Tower Review and Enter to Win! 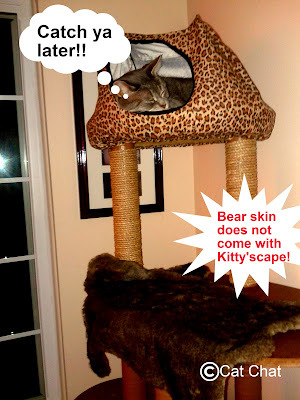 Kitty’scape™ Cat Tower Review and Enter to Win! Oh my Cat my furiends! You are going to be happy that you stopped by today! I have been keeping something under my paw for a while now and it is finally time to spill the kibble!! I was the lucky recipient of a Kitty'scape Cat Tower! to review! This is the same one that I received. "A Whole New Way For Cats To Play"
The model that I received was the Deluxe Model kit and since I am more of a "Tree Dweller", mom decided to construct it more like the photo above. It may also be reconfigured like this or however you choose! as well as a number of other kits. 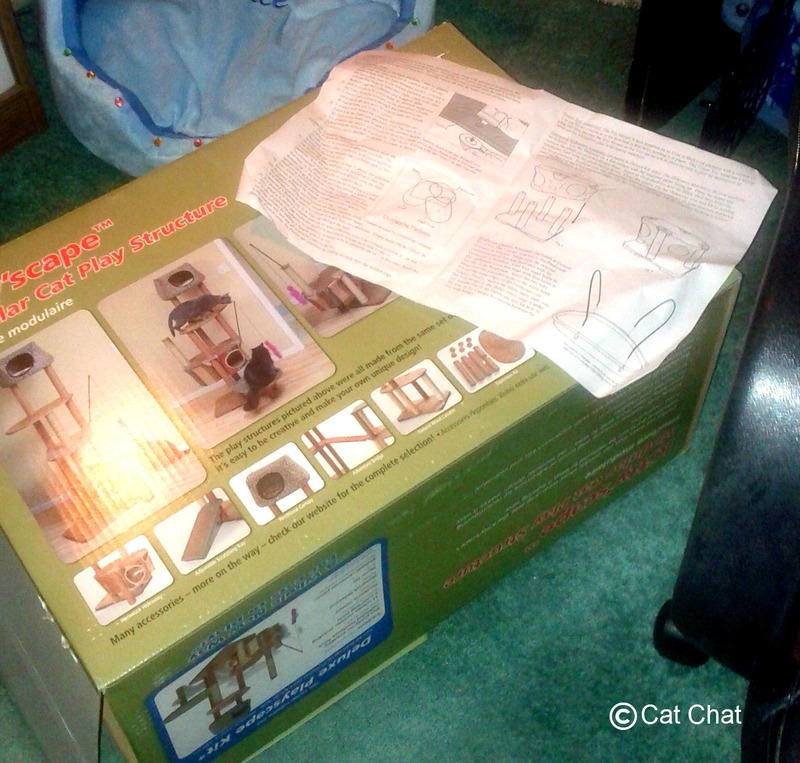 Ok kitties I have to tell you when Mom opened the box and removed the parts, I had my doubts. At first, she did as well. As many of you know, Mom isn't the "handiest" person in the world, and ask my Dad? Um, noooo...he's even worse! Mom completely amazed me! She amazed herself as well! of Mom assembling the Kitty'scape! On the site it states that the Kitty'scape can be assembled in "minutes." For a "normal" person that would be 100% accurate. For someone with limited abilities such as my Mom, it was more like 120 minutes, which in my book is pretty darned good! This is catabulous isn't it? Now it was time for me to purrform my inspection of her construction and of the structure. one winner will be announced Sunday, October 7th! In full disclosure, we were sent one Kitty’scape™ Cat Tower to review and were offered one as a give-away. We were not compensated for this review. All opinions are strictly mine and Mom's! 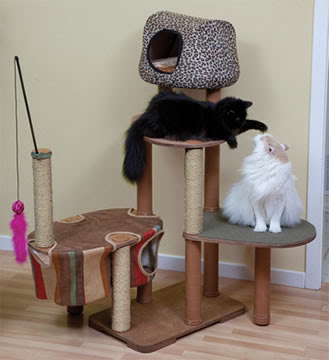 Wow, that is the most stylish cat tower we've seen! I think all 4 cats would love to check it out. Your mom did a great job putting it together! how cool! That looks exactly like what we're looking for! Nice and tall??? This would be the perfect gift for my kitties. I've been wanting one but alas my discretionary funds go to homeless cats. My kitties are telling me my countertops and top of kitchen cabinets are not good enough for Helio and Geisha to play Tarzan & Jane. It would be just in time for my birthday so I'm praying we are ever so lucky! I would love to have this for my babies! I feel bad that they don't have anything this cool! OMC, I am so envious! Of course I am going to enter! Wow! 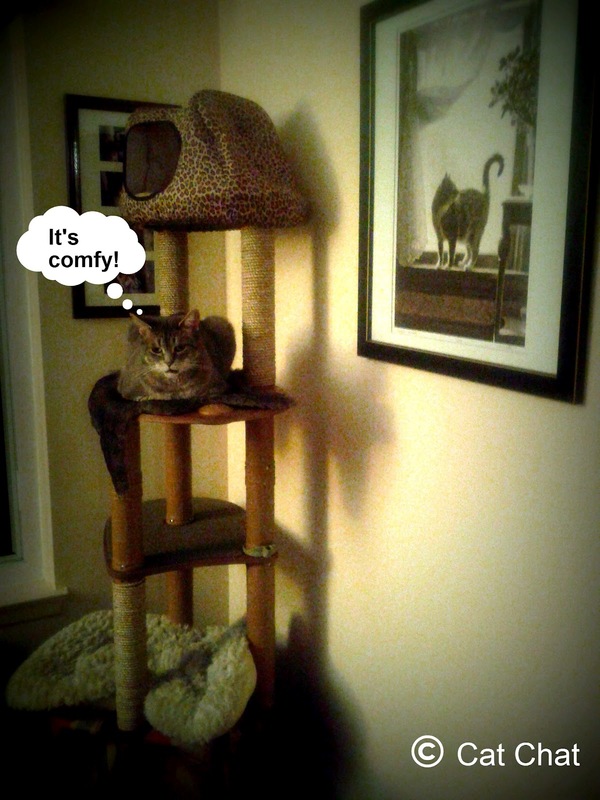 This indeed is a lovely cat tower. Purrs! You are very brave to try it out, how handy is your mum! I wish they did one for dogs that looks ace! That's a lovely looking tower! Good luck to everyone who enters the giveaway! Nice tower. Have a wonderful Monday. That tower looks awesome, Cody! What a lucky kitty you are! I won't let my mom have any kitty house in my house either. 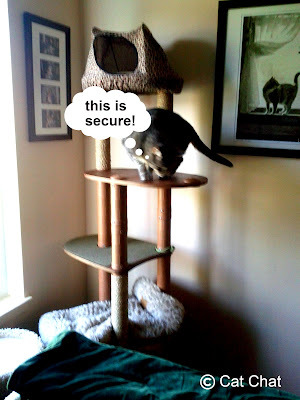 Our cat tree is ancient! We need this! Our kitties would love this! Terrific review Cody! Thanks fur the chance to win! 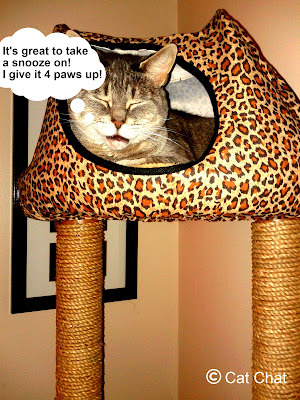 What a pawsome prize. We are sure that if we won it would take our Mommy 120+ minutes to assemble it too but Daddy is super handy so we bet it wouldn't take him long at all. 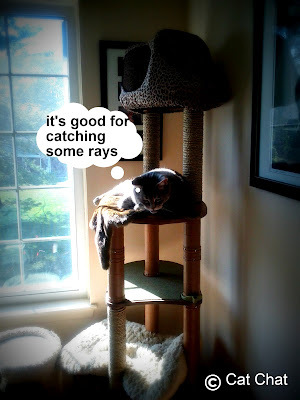 Oh we would love to have that cat tree. It looks fantastic. Thanks for this offer. Wow! 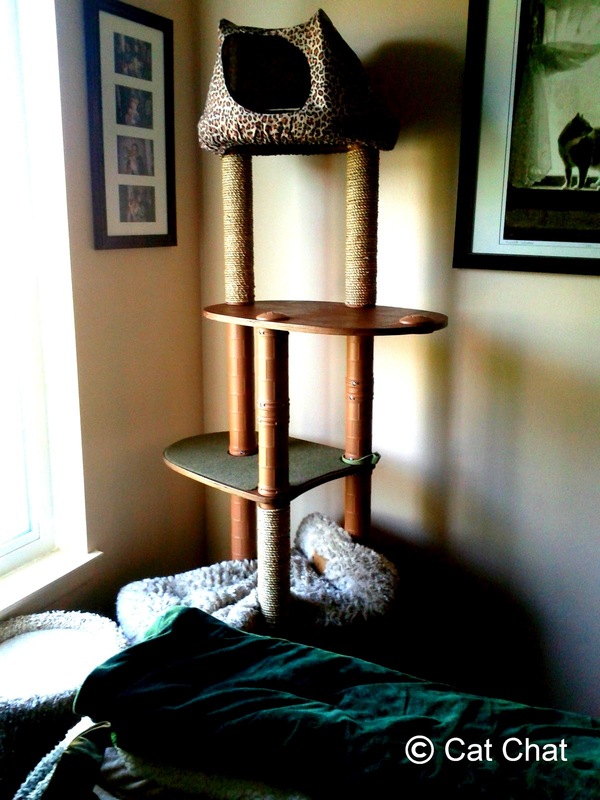 That's one of the coolest cat towers we've ever seen. You're so lucky, Cody! That is sooooooo cool but my Rafflecopter never flies! @Brian...did you mean it didn't work for you? Ahhh - Cody. I hear your mom sadly singing, "When will I see you again....when will we share precious moments..?" We have one bush dweller and one tree dweller at our house. They couldn't be more different. Except in the love and cuddles area. Want, want, WANT! Maybe then we would all be able to gravitate to our own levels together! Caren - when I click on leave an email, I'm not seeing anything to fill in! Pop wants to get me a new tree and this is just purrfect but, alas, Rafflecopter and Random.com don't like me so I'll never win this. Sigh! Why do I even try?? @Vicki let me check it out...thanks for the heads up. It's my first time using it. You look totally at home there Cody! dood...thatz one awesum cat tree N grate job ta yur mom but we iz wunderin wear iz de kitchen level with a frigerator that bee stocked fullz foodz !! 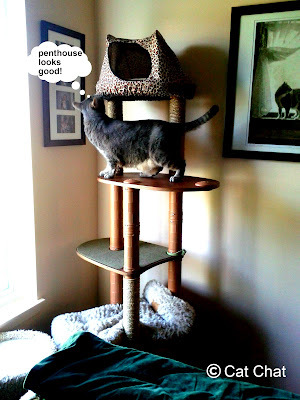 I want this tower for my cats, and for our occasional foster cat! Hooray, my raffle copter took off! Awesome! We were only able to do one entry. This looks so great. I would love to give my climber cat somewhere to get away from it all. It cool that you can configure it in different ways too. And if Cody likes it, it must be good. Forget getting one for the cat, I'm getting one for me!! Cheaper than rent and mortgage and more comfy too! Woo hoo that is something worth meowing about!!!! 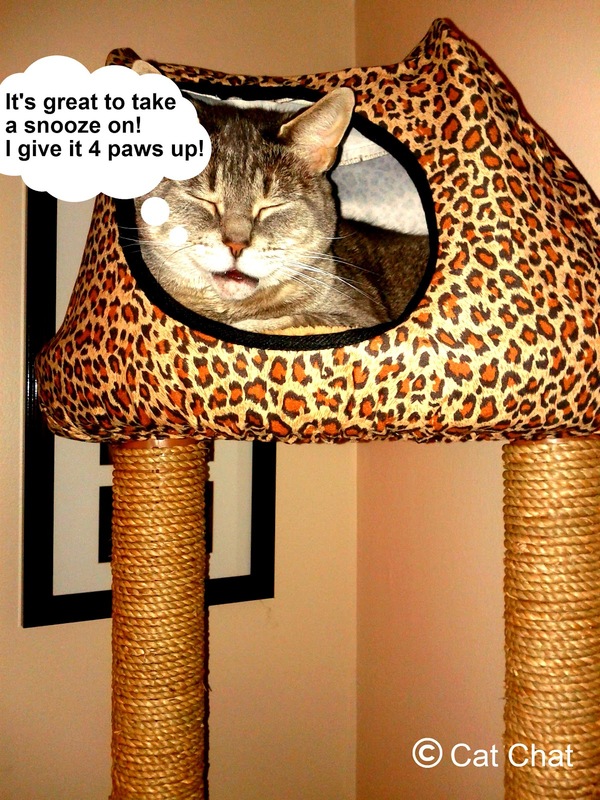 What a pawsome cat tower! And easy to assemble, that's important!! We know we can't enter but we think it looks great. 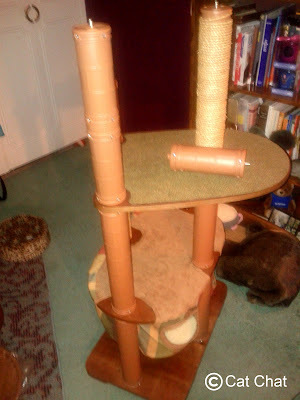 Well, Cody, that's quite a tower you got goin' on there and the Human's impressed that your Mommy did so good putting it together! 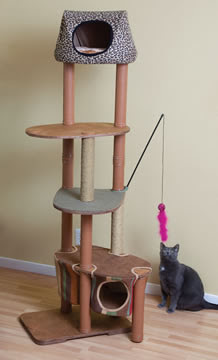 The Human says I'm not allowed to have another tower, but I think somekitty will be soooooo happeez to win it! Our kitties would love that! Our mom is too broke right now to buy something like that. Cody!!! You have definitely been holding out on us!!! 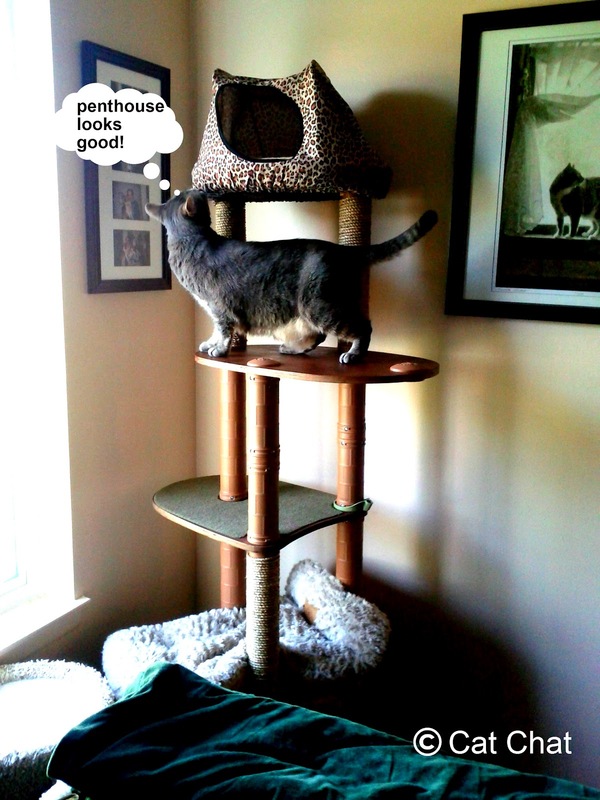 That is one AMAZING cat tree!!! It's like being on top of the world! I can see why you LOVE it! ...and we are very impressed indeed with your mom's "handiness!" max and tate have always wanted one of these but mommy never has enough green papers cuz she's always giving them to the rescues! lol! Max and Tate would LIVE on this thing -- SO innnovative and inventive. this would be awesome in my foster room!! 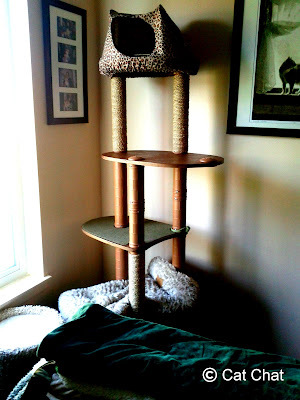 This is the coolest cat tree ever! Less bulk, more style. Love it, love it, love it. They look so much more stylish than the 2x6 I wrapped in carpet in sad mimicry or cat furniture this weekend! Thank you for the chance! We love to climb and snuggle! That's a pawsome tower! I would love to have that. And we need a new one. Our old one is starting to come apart. I wish I could enter! My 3 would LOVE this!! Wow, Enzo would love this. He loves to climb, climb, climb to the top of the refrigerator. That looks like fun! I tried to enter (Saturday Oct 6th at 5pm) and it tells me I'm too late! Bummer for me cuz that kitty tower looks like lots of fun! sorry Cat Guy...it ended Friday...have to pick the winner which will be announced at some point on Sunday (or Monday because I am running behind) Sorry! !